Heathrow to Victoria Station Taxi – Heathrow to Victoria Station Taxi – Book Heathrow to Victoria Station Taxi, To/From Heathrow to Victoria Station Taxi & Get 10 % Off! – Victoria Station is known for many things: location, number of annual passengers, multiple means of transport (Tube, Railway, Coach), nearby railway stations, close touristic objectives, business venues, sights, shops, markets, museum, art galleries and many more. Another important symbol for the capital city of the United Kingdom is Heathrow Airport, one of the busiest airports on a worldwide level. What is the connection between them, you might ask yourselves. Well, you can read all about it at the end of this article, where we have prepared for you a series of airport transfers from Heathrow to Victoria Station area. Another question regards how to spend your free time after you arrive at your destination. You will surely find a lot of recommendations in all kinds of brochures and travel blogs. However, most of them are limited to local attractions, galleries, libraries, pub, restaurants and other examples like these. We have thought that maybe you will also enjoy some of the leisure centers that Victoria Station area can offer you. Why not relax after a long day of shopping, visiting and local cuisine tasting? Some of the most appreciated places, not only by travellers, but by Londoners as well, are the following: Big Bus Company (48 Buckingham Palace Road, Victoria, London SW1W) offers you a pleasant tour within the capital of the United Kingdom, thus eliminating that stressful planning; Argonauts (Queen Mother Sports Centre, Vauxhall Bridge Road, Victoria, London SW1V) is great if you are passionate about diving or if you want to try it for the first time; Urban Retreat at Harrods (5th Floor, Harrods, Westminster, London SW1X) is a luxurious spa with a unique interior design. Other nice and recreating possibilities that are situated at a walking distance from Victoria Station area are: Green Park (Piccadilly, St James’s, London W1J), Ushvani (1 Cadogan Garden, Knightsbridge, London SW3), Four Seasons Hotel Park Lane Spa (Hamilton Place, Park Lane, Mayfair, London W1J), The Berkeley Health Club & Spa (The Berkeley, Wilton Place, Belgravia, London SW1X) and Catalyst Health and Fitness Ltd (30 Bury Street, St James’s, London SW1Y). In order to get a Heathrow to Victoria Station Transfer by rail, you have the train from Heathrow Airport Term 1-3 (every 10 minutes) followed by the Gloucester Road Underground (every 5 minutes) and then just have a 2 minute walk. This whole journey takes about 45 minutes. Another option would be to take the bus from Heathrow Central Bus Station (every 60 minutes) via St James, Trafalgar (every 10 minutes line 11) and finally enjoy a short walk of 2 minutes. This journey will take about 1 hour and 20 minutes. A Heathrow to Victoria Station Transfer by car can be done by taking the M4 motorway and then the A4 one. Heathrow Airport is at a 16.9 miles distance from Victoria Station. This journey will take about 32 minutes, without including traffic. A Heathrow to Victoria Station Taxi with 247 Airport Transfer is going to take about 47 minutes, including rush hour traffic. The price for a Heathrow to Victoria Station Taxi starts from 42 GBP. 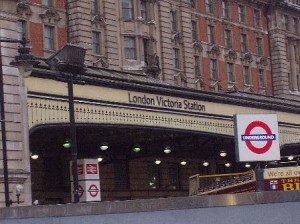 The central London railway terminus Victoria Station, also known as London Victoria, is the second busiest station in London after Waterloo. It is also very famous, it is mentioned in the Sherlock Holmes short story The Final Problem, in Oscar Wilde’s The Importance of Being Earnest, and in the short play Victoria Station of Harold Pinter. Because of the overcrowding, TfL is planning to expand and upgrade the station at a very high cost. If your planning on visiting London, we advise to take a Heathrow to Victoria Station Taxi. After arriving to your destination, have you thought how to spend your time? On travel blogs and brochures, you will find a lot of recommendations, starting with local attractions such as galleries, libraries, pubs, restaurants. Why not relax after you take the Heathrow to Victoria Station Taxi? Go shopping or try a local cuisine tasting, Victoria Station area has a lot to offer, why not take advantage of that. Starting with the first years of usage, this station became unexpectedly popular. I hope we convinced you to give us a try!